Read on for Larissa’s thoughts on a dream cast for the series (Chris Hemsworth and Channing Tatum are 2 possibilities!) and much more! Larissa- thank you for stopping by Traveling With T! Thanks so much for having me! I’m very excited to be here. Can you describe DEATH IN PERSPECTIVE in 15 words or less? Are the characters in the Cherry Tucker series based on anyone you know in real life? All the characters are personality composites based on their backstories I created except Max Avtaikin, the Bear. I got the idea for Max from watching the old Direct TV commercial starring the wealthy Russian with the tiny giraffe. I got such a kick out of that character, I couldn’t resist using him for the idea of Max. Of course, Max’s character evolved from that characterization, but I still think about that tiny giraffe whenever I write. I do listen to a lot of Miranda Lambert and Pistol Annies songs when writing the Cherry Tucker books. Their songs really helped to form Cherry’s tough yet kind character. Should the Cherry Tucker series be read in order? Or are they also considered “stand-alones”? You can read any of them out of order, but the subplot about Cherry’s family troubles and her love life continue as a longer arc through the series. So if you’re just looking for a mystery, pick up any of them. I give enough hints as to what’s happened in the past so you won’t be lost if you read them out of order. But I also try not to dwell on past events to bore the readers who do read in order. A tricky but important line to walk, I think! How much input do you have in the book covers? For my first cover, I received the image of the cover from my editor with a “how do you like it?” Good thing I loved it! Now I fill out a sheet naming story themes or ideas, but we continue with a similar motif with the picture frame, related colors, and fonts. Just what’s in the picture frame is always a surprise for me! If Cherry Tucker Mystery series was made into a TV series or movie- do you have ideas for dream cast? Wouldn’t that be fun! Maybe Clare Bowen who plays Scarlett O’Connor on Nashville. I haven’t watched the show, but if Clare could play a tiny, blonde spitfire, that’d work. I always thought of Cherry’s on/off flame, Deputy Luke Harper, as a cross between a young Paul Newman and Jake Gyllenhaal. Dark, broody, and dimpled. How about Chris Hemsworth or Channing Tatum for Todd? Big, blonde and friendly? Like a handsome golden retriever. Max Avtaikin is harder for me to picture (he doesn’t look like the Direct TV Russian, just sounds like him). He’s in his mid-30s, but a big, rugged guy, with ice blue eyes. He reminds me a little of Karl Urban (he played “Bones” in the new Star Trek movies), but he’d need blue contacts! What’s next in the world of writing, Larissa? Are you working on another book? I am writing Cherry Tucker’s fifth book, The Body in the Landscape, which will be out sometime in 2015, hopefully the spring. This time Cherry’s asked to do a “kill portrait” at a Big Rack hunting lodge. When she discovers a body in the woods, the participants in the weekend-long wild hog hunt become suspects with secrets. Cherry and her friends try to discover the killer before he or she strikes again. Want to know more about DEATH IN PERSPECTIVE? The curtain rises on Cherry Tucker’s debut as a high school set designer at the posh Peerless Day Academy. Cherry’s been hired for an adaptation of Romeo and Juliet, but the drama director is hoping Cherry can also turn the spotlight on a malicious social media bully who’s sending poisonous texts to the faculty. The director’s got his own drama to hide, and the phantom texter seems eager to spill school secrets. When the principal’s secretary commits suicide, Cherry suspects foul play. With Deputy Luke Harper ready to return as Cherry’s leading man, he’s eager to assist in finding the phantom culprit, but Cherry fears family secrets offstage may doom them to the role as star-crossed lovers. With the bully waiting for a murderous encore and her own family skeletons to hide, Cherry scrambles to find her brother and the mysterious texter before the phantom decides its curtains for Cherry and forces her to take a final bow. Follow Larissa: Twitter and Facebook. 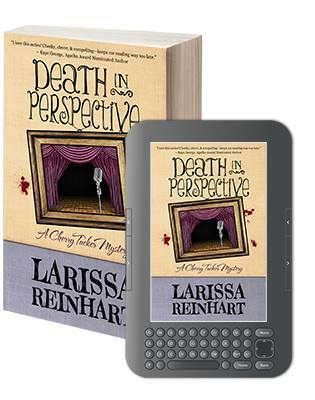 Win one of the Cherry Tucker mysteries (winner’s choice!) Giveaway is open to US only and will end July 14th. Check the Rafflecopter link for more info! Thanks for the fun interview! I had fun casting Cherry’s characters. Good luck to the contest contestants!